Progressive Bad Beat Jackpot by BetOnline is on! The larger the jackpot, the easier your chance to win! Take a seat at any of designated Bad Beat Jackpot tables. If you lose with Four of a Kind Jacks or better, you hit the Jackpot! You and all others playing at Bad Beat Jackpot tables will share in the sweet jackpot. Plus, as the jackpot grows, BetOnline will periodically make the qualifying hand easier, increasing your chances of hitting the big one! The most current qualifying hand will be displayed in the poker software banners. Check these banners to confirm the most recent requirements. Register now and try out your luck! There is a great promotion for SNG lover on BetOnline – WEEKLY SNG CHALLENGE! Choose your favorite format and win some extra money! Just like before, you will earn points when you play in your favorite Sit ‘n’ Go Tournaments. The more points you earn, the more extra cash you will score after the promo comes to an end. With 1st Place paying out at $750 and 20 weekly winners in all, it’s definitely worth your while to get in on the action. So, all you have to do is to choose your favorite SNG format and start earning more money! If you still don’t have an account at BetOnline, join it with us, and check here for the benefits you will get! BetOnline Poker has made significant changes to its Cash Race promotion. It will give recreational players more opportunities to benefit from the promotion as well. Earlier, it used to be the weekly promotion, now it is the daily cash rake race. Now BetOnline Poker has changed its Cash Race leaderboard promotion from weekly to daily, extended the number of stake levels from three to six, and altered the way in which you get leaderboard points to share the $1,100 prize pool. The changes should also result in a fairer playing experience for everyone. If you still don’t have an account on BetOnline Poker, join today! There are many other benefits this room offers. Check for all of them on our site! Do you want to boost your bankroll without risking any money? YourPokerCash brings you a list of freeroll tournaments. If you sign up with us you will be eligible to participate in those freerolls. If you are having any trouble with registering, or with anything else, do not hesitate to contact us! We will be more than happy to help you! Creating a new account at 888poker with us will give you $1 in real money to your poker account, also get $7 in tournament tickets and a pending $80 bonus. Players have 14 days after creating an account to take advantage of this no-deposit offer. All you have to do is to go here and click the Sign Up Button. RedStar offers Daily Freerolls. More than $20,000 monthly guaranteed in total! All players can enter into the tournaments! There are no requirements at all. That means no entry fee required, no deposit required, no Loyalty Points minimum required to enter and no Loyalty Points requirements to withdraw. You just need to click here and go to the Sign Up Now button and start to enjoy playing at RedStar Poker! As a new Poker player, you can take part in our New Player Tournaments and get a feel of how to gain your edge against the other players. In fact, you can play in these over 4 week period! Register a Poker Alias today and you will instantly be awarded 28 tickets to enter Level 1 Tournaments. All you need to do is click here and then on the Sign Up Now button. 888 poker brings even more benefits with a deposit you make. Along with the $88 Free, 888poker is giving players 100% up to $400 deposit match bonus. Additionally to getting your first deposit bonus, you will also get 7 tickets to 888poker’s daily $500 Depositors’ Free Tournaments. Including 2 tickets to the $1,000 Depositors Free tournaments. First-time depositors also receive a ticket to the “First Depositors’ Challenge Tournament” which happens every Friday at 19:00 GMT. The top 10 players get a seat at the Sunday Challenge Tournament! And that’s not all! Every week that you deposit at least once, you’ll get 2 additional tickets to $1,000 Depositors Free Tournaments. So you can play for free again and again! Sign Up to 888 poker here now and enjoy your freerolls! New sign-ups can now access two New Player Freerolls worth up to $100 each day for 60 days simply by making their first deposit. 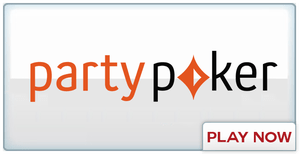 Sign Up with us, make a deposit and enjoy in partypoker New Player Freerolls! Additionally, you can boost your bankroll for free! 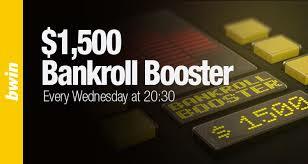 Simply collect 2 Poker Points playing real-money poker games, and you will earn a ticket to the weekly “$1,500 Bankroll Booster” Freeroll every Wednesday at 20:30 (CEST) where you can simply compete for an amazing $1,500 prize pool! To take part in this freeroll, click here, register, make a deposit, collect 2 points and enjoy! After making your first deposit, you will get a €10 Casino Games, €5 Twister Entry to €5,000 Jackpot Prize and €10 in Tournament Tokens for Betfair Live Events. Sign Up with us here and enjoy! After claiming your first deposit bonus upon signing up at making a £10+ deposit at Coral, you will also receive £20 free worth of cash and tokens. Do not miss it! Sign Up Now here. Open an account with Poker at bet365 – Up to €100 New Player Bonus! New Poker customers only. Minimum deposit/transfer of €5 to Poker. Bonus Euros are redeemed in installments. Time limits and T&Cs apply. Titan Poker brings you $12,000 in New Depositor Freeroll Tokens! All freerolls in the $12K Token Package are found under the ‘Special Offers tab’ in the Titan Poker software. Sign Up here now and enjoy! Creating a Unibet account couldn’t be easier and they now have a special welcome package to share with every player. Receive €200 progressive bonus. Followed by 4 entries to the weekly €500 Welcome Freerolls and a free €2 Unibet Open qualifier ticket. Also, there is a Daily Freeroll Frenzy. Unibet has an abundance for you to try each and every day. Freerolls, that you are qualified to, offer tickets for both cash games and tournaments. On top of that, you win real money by eliminating players in the freerolls. You will earn cents for knocking players out! You will earn 2 cents per player that you knock out. Sign Up with us here and enjoy! 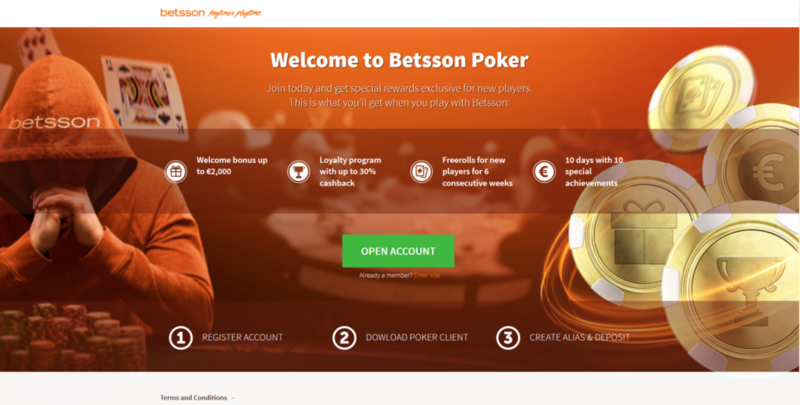 Sign Up to Betsson poker here and start playing! After they make their first deposit, all new Poker players at Betsafe will automatically receive a ticket to the €888 New Player Freeroll played the following Wednesday at 14:00 CET. New players are entitled to play in up to 6 €888 New Player Freerolls within 6 calendar weeks since they have registered a Poker Alias. Sign Up to Betsafe Poker here, make your first deposit and enjoy those great freerolls! After they make their first deposit, all new players have the chance to take part in exclusive tournaments every Wednesday. As a new player, you can participate in Nordicbet’s €1000 New Player Freeroll and €500 New Player Turbo tournament. Sign Up to Nordicbet poker here. After you made your first deposit RedKings will give you a FREE €5 Tournament ticket. Also, every new player to RedKings has a chance to play in two tournaments after making their first deposit, the €500 Added New Player Tournament and the €1,000 New Player Freeroll. Sign up here and take advantage of those freerolls! Besides the Daily Freerolls, for which you don’t need to make a deposit, there is also a €3,000 Sunday Freeroll. To take part in it, you will need to play 100 raked hands within 7 days before the tournament. Sign Up to Redstar Poker here and enjoy! Boost your bankroll with up to 4 New Depositor Freerolls with $250 prize pools! Upon making your first deposit you will receive an email with the password to the New Depositor Freerolls for that calendar month (up to 4 Saturdays). New Depositor Freerolls take place every Saturday at 12:05 pm ET. To Sign up to BlackChip Poker click here, and for Americas Cardroom here. Make the deposit and take money from these freerolls! If you are new to BetOnline.ag, there is a seat to Sunday’s $10,000 New Player Freeroll with your name on it. To claim your free seat, just make your first-ever deposit at BetOnline.ag and you will then be awarded an entry ticket which will run on the 2nd Sunday of each Month at 17:00 ET. Sign Up to BetOnline Poker here and start playing! Do you want to play several freerolls every month? All you have to do is to register to partypoker or bwin through YourPokerCash, make a deposit (the lowest amount offered by the site is enough) and win that money! Also, if you have an old real money account on these two sites or at least one of them, and you have been inactive for 1 year or more, you should contact us and we will make you a YourPokerCash member! You can check those great freerolls here! And that is not all! By registering through YourPokerCash to partypoker and bwin you will participate in $15.000 rake race every month, plus you will be awarded 10% of extra rakeback every month! Once again, if you have any trouble with registering or depositing etc, be free to contact us! We are here to help you! And, do not forget to check all of our offer reviews, where you can find lots of that interesting. When you make your first deposit, double it up with the 100% match poker bonus. After you make your deposit, simply send an email to freeplay@betonline.ag with the Bonus Code NEWBOL as the subject line. Your bonus will then be released into your account $10 at a time. If you are new to BetOnline.ag, there is a seat to Sunday’s $10,000 New Player Freeroll with your name on it. To claim your free seat, just make your first-ever deposit at BetOnline.ag and you will then be awarded with an entry ticket which will run on the 2nd Sunday of each Month at 17:00 ET. $1,100 worth of extra cash prizes is up-for-grabs each and every day for loyal cash game players. To get your share of the $1,1K, simply play in any of our real-money ring games. Once you are in on the action you will earn points based on your play and work your way up the Leaderboard to some extra cash winnings. Check out the leaderboard. Boost Poker is a fast-paced high-action format used in both cash games and tournaments, in which participants are playing against a pool of players. The Boost Poker table will look like a regular table, but players who fold their cards are immediately moved onto a random table against different opponent`s before the hand is completed. Plus, as the jackpot grows, we will periodically make the qualifying hand easier, increasing your chances of hitting the big one! *Note: Check these banners to confirm the most recent requirements. Weekends at BetOnline just got fistfuls of dollars better with a stunning $250,000 in guaranteed prize pools waiting to be won! Crush it in our Poker Room, with some red-hot action and a bunch more big money guarantees added to the new line-up every weekend. Check all the leaderboards here. Earn 200% up to $200 for every new customer that signs up through you. Plus make your way up the $10,000 Leaderboard Challenge. Click Here to view the Leaderboard and more details on the contest! Best part you get to choose your type of bonus you would prefer to earn. (Sports, Casino or Poker). There’s no limit to how many referrals you can generate, which means there’s no cap on the bonus you can earn. We will match 200% up to $200 on your friends first deposit. 1. After logging-in visit our Refer-A-Friend page. Choose which type of bonus you would prefer to earn: SPORTS, CASINO or POKER. 3. Once your friend(s) makes their first deposit, we’ll match 200% up to $200 and your bonus will be transferred directly into your account. 4. Repeat for more referrals!